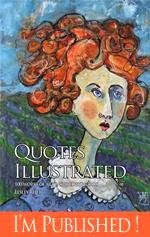 Happiness is having your name drawn as the winner in a blog giveaway! Extreme happiness is when the giver is the super talented Lori Vliegen from elvie studio! Lori recently celebrated her 500th blog post (yikes!) and she generously offered up an excruciatingly scrumptious, beautifully hand made, doodle journal to one lucky blog reader. As if receiving this magnificent prize wasn't enough, it arrived wrapped in multiple layers of happiness with no detail overlooked. Grab a cookie or glass or wine and come along for the unveiling! 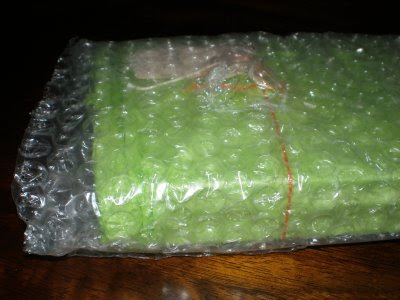 First up is a protective layer of bubble wrap. It's both practical and pretty when a hint of lime green and other goodies is peeking through. 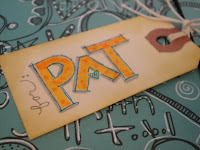 A lovely layer of gorgeous green tissue paper is next with this humorous little tag delicately tied with colorful string. Who is this mysterious inspector #12? 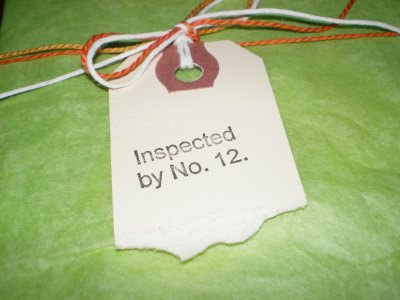 If his or her job is to inspect and ensure the quality of craftsmanship on this journal then inspector #12 has the easiest job in the world. 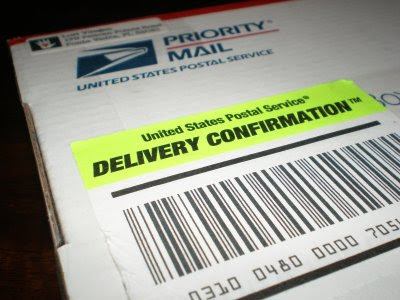 The covers are perfectly wrapped. The stitching is superb. With construction this meticulous, inspector #12 might as well eat bon bons all day. Wait! That's it! Knowing Lori's legendary love of chocolate, inspector #12's top priority is probably making sure journals don't leave elvie studio with any chocolate fingerprints! Another little surprise was waiting beneath the tissue paper. 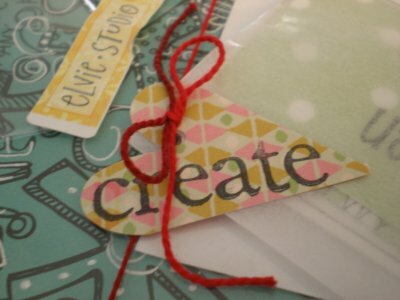 A clear plastic envelope added another layer of protection and was sealed with an adorable elvie studio sticker and another carefully tied string held this sweet paper heart. The heart was attached to a mini glassine envelope that housed a personal note from Lori and an elvie studio business card. Finally, the star of the show revealed! And isn't she a beauty? I love the way Lori embellished this doodle print paper with doodles of her own in white. 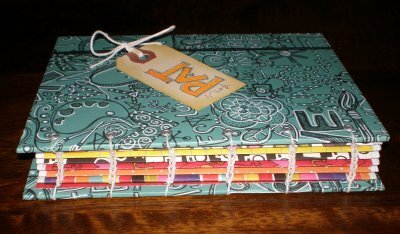 Look how colorful and beautiful the spine is with all these yummy papers! A black elastic band holds everything together perfectly. 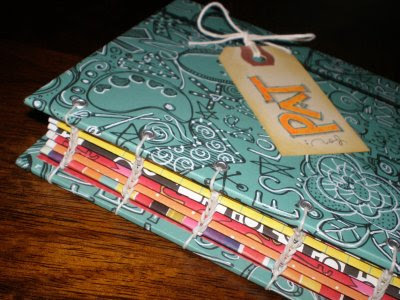 I'm going to leave the "Pat" tag on because I think it's gorgeous and because I want everyone to know this journal is MINE. 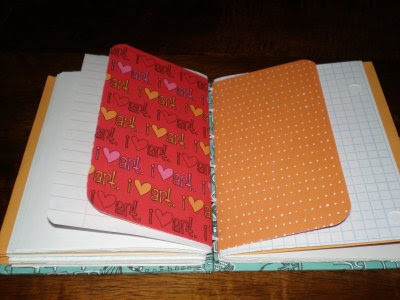 The pages are a combination of graph paper, ledger paper, notebook paper and envelopes to stash all sorts of secret stuff. Each signature is wrapped in eye-popping paper that adds a nice burst of color throughout. 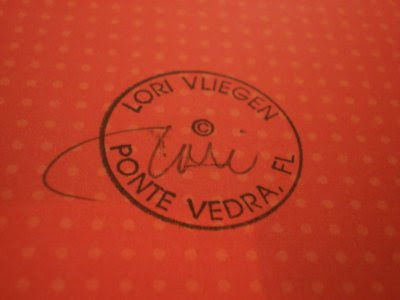 Last, but not least, the proof that this journal is a true work of art is the signature stamp on the inside back cover. 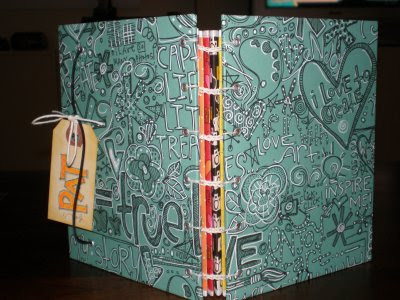 It's obvious that Lori puts a lot of care and thought into her journals and into their presentation and wrapping as well. Can you tell I'm thrilled with my prize? Check out Lori's Etsy shop and treat yourself to one of her journals. You'll be glad you did! PS The wrapping was even nicer than what you see in these photos. After opening everything up, I re-wrapped it (not quite as nicely) to take pictures. Then I got to enjoy the process of opening it all over again! Holy cow! What a haul. You lucky dog, you! Wow, that's a great journal! Nice score! Wow, what a fabulous journal.